MultiBrief: How does industrial design work? How does industrial design work? The popularity of industrial design (also known as product design) has accelerated due, in part, to a new wave of designers and advances in technology, materials, processes and capabilities that have dramatically improved the design options available to clients. Working closely with engineers, industrial designers are trained on function, aesthetics, ergonomics, anthropometrics and manufacturing processes to provide clients with the best "working" concepts from sketches, to renderings, to CAD models that create their final products. These designers are trained to fulfill every subcategory that goes into the product design process to help clientele at any stage — from sketching, to material and process selection, branding, packaging and more. 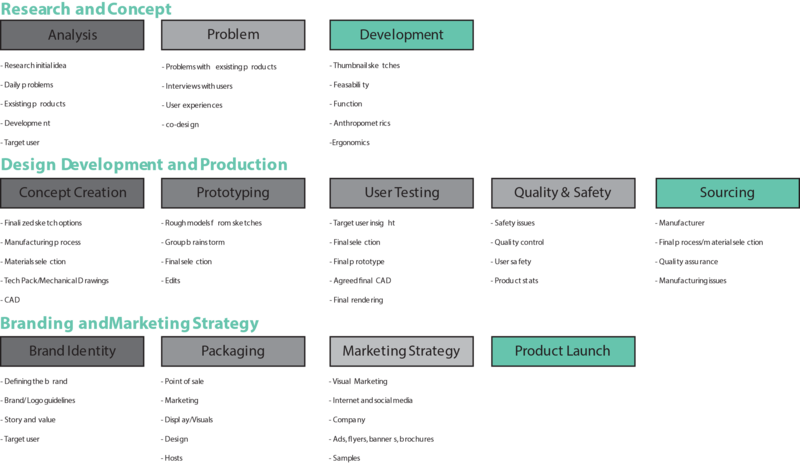 Below is an example of how a product is made from the beginning to a finalized prototype. Within these categories and subcategories, there are even more detailed services that go into each step. Sometimes it is a "rinse and repeat" cycle where, after the user experience and feedback, one needs to restart from the beginning with new sketches and a new development plan. Sometimes this can happen multiple times at different stages of the process — the best advice is to expect hiccups and plan accordingly. Also, clients can skip certain steps in the process if they are already fulfilled or not needed for the specific project. A detailed analysis of the project at an introductory consultation can help better define the specific timeline and requirements. This project scope can be provided at clients' request and is offered at no cost by most design companies. An industrial designer's background typically includes courses on sketching, rendering and mechanical drawing. This better insures they can provide quick preliminary sketches, final clean-hand renderings and mechanical drawings for manufacturing. They are also trained to convert these into digital files using Adobe Suite as well as a multitude of CAD software including SolidWorks, Rhino, Auto CAD and Sketch Up. This allows them to quickly design a product, sketch, model and prototype in an efficient manner that utilizes their research, materials and manufacturing knowledge. From the created CAD files, they can 3-D print or rough-hand model a prototype for aesthetic or quick-fit testing, often using in-hand materials to achieve an approximation of the final product. These are used for target-user testing, sales pitches and size, color and fit confirmation. Many companies are expanding their capabilities by including an industrial design into their product design process. In doing so, this helps clients from product conceptualization to launch much faster and more efficiently with better end results. When clients first come to a design company, sometimes they have a complete design ready to be made, but often they only have an idea of what they want. 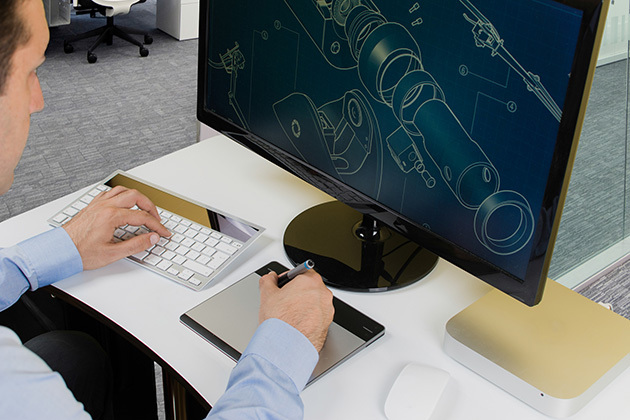 Introducing new industrial design capabilities is a critical step toward helping the customers make their vision a reality. Once a client contacts a company with a new design, they will arrange a meeting with its team of engineers and designers to discuss the concept. The industrial designer then works with the client to create multiple rough 2-D sketches for the conceptual form that evolves into a final realistic 2-D rendering (that may be kept). When clients choose a final form, they can add additional aesthetics. These can be anything from color to contour lines, or personal brands and logos to get the finalized look. The engineers then take this design that the client and industrial designer created and makes a CAD model with the specific dimensions, which is used to 3-D print a prototype. Most companies will work with their clients on any additional iterations and sources the final manufacturing for them. Additionally, these designers agree to sign nondisclosure agreements (NDAs) to allow clients to keep full custody of their project's idea, sketches, final project and everything that went into creating their masterpiece. Industrial designers just want to help ideas come to life. In the end, these designers are evolving as quickly as technology is growing. With new manufacturing and new materials being made every day, they stay on top of it all to provide entrepreneurs, inventors and anyone who has an idea, the best possible solutions to bring their products to life.